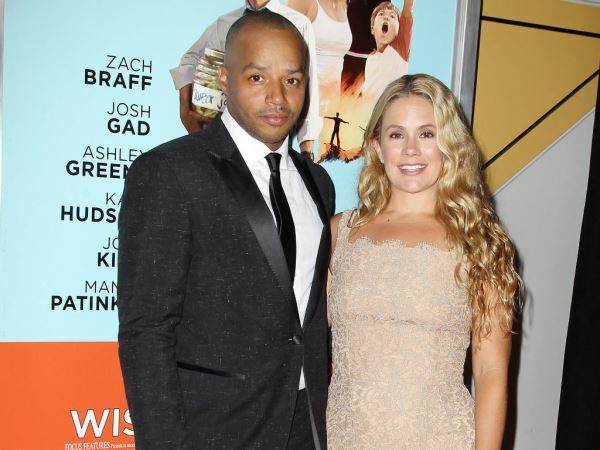 Donald Faison and CaCee Cobb are expecting their second child together. Donald Faison and CaCee Cobb are expecting their second child together. The 40-year-old Scrubs star, famed for his role as Dr. Chris Turk in the ABC medical drama, confirmed his 36-year-old wife is pregnant in an Instagram post on Tuesday afternoon. Both he and CaCee shared a cute photo of their 14-month-old son Rocco, with their big family announcement photoshopped onto the front of his shirt. “I’m a big brother! !” exclaimed the text on the smiling little one’s yellow top. A pink bow tie and handful of colourful balloons were also planted in Rocco’s left hand. Both Donald and CaCee uploaded the image at the same time to officially deliver their news to friends and followers. The couple are surely over the moon to add to their growing family. Just two months ago on August 16, CaCee took to Twitter to wish Rocco a happy first birthday. “I don't know what I did to deserve such wonderfulness,” she gushed on the social media platform. Speculation that the blonde beauty was pregnant began about a month ago. The pair have been photographed out and about a number of times with Donald rubbing CaCee’s stomach. The couple got married in December of 2012, in a ceremony held in actor Zach Braff’s backyard. CaCee is singer Jessica Simpson’s best friend and former personal assistant. This will be Donald’s sixth child. He is also a father to son Sean from a previous relationship as well as twins Dade and Kaya plus son Kobe, all from his first marriage to Lisa Askey.